Today, 80+ years later, headlines shout the dangers, not the joys, of a warmer Earth – drought, fire, flood, disease, economic loss, and political instability. Effective since 1994, the United Nations Framework Convention on Climate Change, UNFCCC, is the world’s first climate treaty. 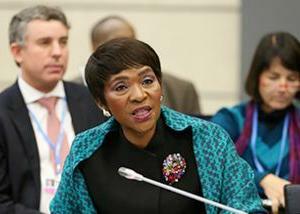 It sets an overall framework for intergovernmental efforts to tackle the challenges posed by climate change. It recognizes that the climate system is a shared resource whose stability can be affected by emissions of carbon dioxide and other greenhouse gases. With 196 Parties, the UNFCCC has near universal membership. It is the parent treaty of the 1997 Kyoto Protocol, ratified by 192 of the UNFCCC Parties. The Kyoto Protocol limits the greenhouse gas emissions of 36 signatory governments, all of them industrialized countries, but not the United States, which never ratified the Kyoto Protocol. On November 30, the world will gather in Paris for two combined climate meetings – the 21st Conference of the Parties to the UNFCCC, known as COP21, and the meeting of the Kyoto Protocol Parties, known as CMP11. UN officials estimate that 10,000 government representatives, 14,000 observers, and 3,000 media will attend. The delegates to COP21 are expected to approve a new universal agreement limiting greenhouse gas emissions that is legally binding upon all nations, developed and developing alike. Since 2011 the legal form and content of the new agreement have been the focus of working group negotiations. 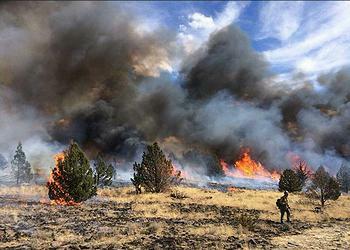 In early October, a 34-page draft was released. Everything in brackets in the draft text – and that is a lot – requires additional negotiation. Some observers are already wondering if the new agreement can actually be finalized in Paris. Why does the world need another climate agreement? To answer this question and make sense of the COP21 negotiations as they unfold, it helps to understand the existing agreements and their major sticking points. The 196 UNFCCC Parties are urged to report annual emissions, design domestic climate policies, and cooperate with each other. 1. Firewall Debate – Two Standards: A country’s greenhouse gas reduction burden is based on the international law principle of “common but differentiated responsibilities.” Countries are classified as developed (Annex I) or developing (Non-Annex I) – two very different standards. 2. Top-Down (Multilateral) or Bottom-Up (Unilateral) Debate: Emission reduction obligations are imposed on Annex I Parties. These rules are set by the terms of the Protocol, a top-down, multilateral process. Non-Annex I Parties are encouraged to reduce emissions by designing their own domestic policies, a bottom-up, unilateral system. Many developed countries strongly oppose the top-down approach. First, they object to being told how to handle sovereign greenhouse gas emission decisions. And, second, they object to the 1992 classification system which still classifies some of today’s major emitters – China, India, Indonesia, and Brazil – as Non-Annex I. The result of these obstacles is that after the first Kyoto five-year commitment period (2008-2012) expired, the second commitment period was not approved by enough Parties to become effective. So today, the Kyoto Protocol is more or less an empty shell and ongoing global negotiations move very slowly. Dr. Pease points to the Mauna Loa Observatory Keeling CO2 Curve, a graph that has plotted the changes in concentration of atmospheric carbon dioxide since 1958. Before COP21 in Paris, each country was invited to submit a non-binding statement of domestic preparations to achieve the UNFCCC objective called Intended Nationally Determined Contributions, or INDCs. 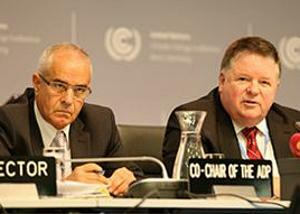 The UNFCCC Secretariat will compile the INDC submissions and create a report of the anticipated global effect. Observers speculate that this process is a step toward resolving the top-down bottom-up debate in favor of the bottom-up side. It is unclear whether a new climate change treaty can overcome the bitterness that divides developed and developing countries on these issues. Negotiators at COP21 may have a tough time agreeing on pragmatic economic solutions to limit global average temperature rises. Countries must find the political will to act collectively and, later, follow through with domestic laws, which may be contrary to their sovereign economic interests. Christina Figueres, UNFCCC Executive Secretary and chief champion of the new climate agreement, hopes Paris will be a new beginning. “These INDCs – or national climate action plans – represent a clear and determined down payment on a new era of climate ambition from the global community of nations. 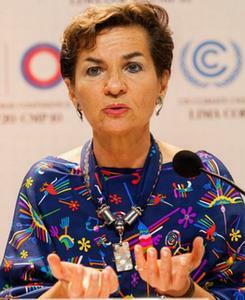 Governments from all corners of the Earth have signalled through their INDCs that they are determined to play their part according to their national circumstances and capabilities,” said Figueres in a statement October 30.